(TORONTO, ON) March 21 is the International Day for the Elimination of Racial Discrimination. This year, the day comes shortly after at least fifty Muslim worshippers were murdered and many others injured in a white supremacist terrorist attack in New Zealand. Only a few years ago, in 2017, six worshippers were murdered in a similar act of violence at the Centre Culturel Islamique de Québec. Hate continues to grow in our country; statistics show that the number of white supremacist and nationalist organizations has doubled in Canada since 2017. That year, a record number of hate crimes were reported in Canada and the province where the most incidents were reported was Ontario. The OFL calls on all parties in the legislature to give their unanimous support to Bill 83, The Day of Remembrance and Action on Islamophobia Act put forward on Tuesday March 19 by NDP MPP Rima Berns-McGown. The Bill would proclaim January 29 of each year as a Day of Remembrance and Action on Islamophobia. The OFL urges all Ontarians to unite against Islamophobia and participate in the campaign to declare January 29 a National Day of Remembrance and Action on Islamophobia by emailing your local MPP. The OFL has produced information sheets on intervening to stop racist, xenophobic actions happening, and encourages all Ontarians to work for inclusion and understanding. 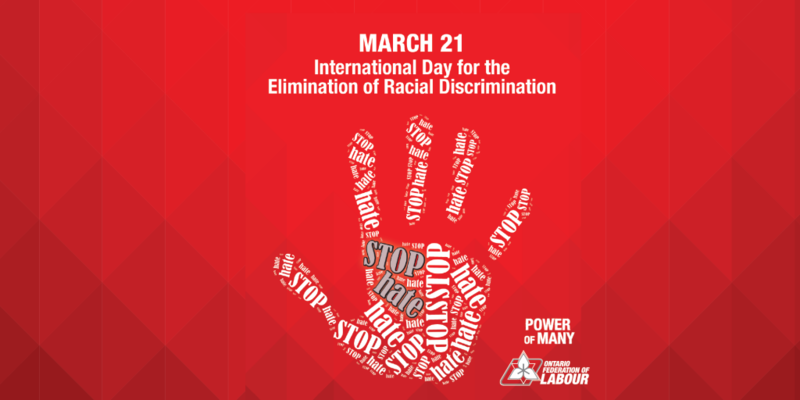 The OFL has also produced a downloadable poster for the Day for the Elimination of Racial Discrimination.